This former camper now mentors children with disabilities. 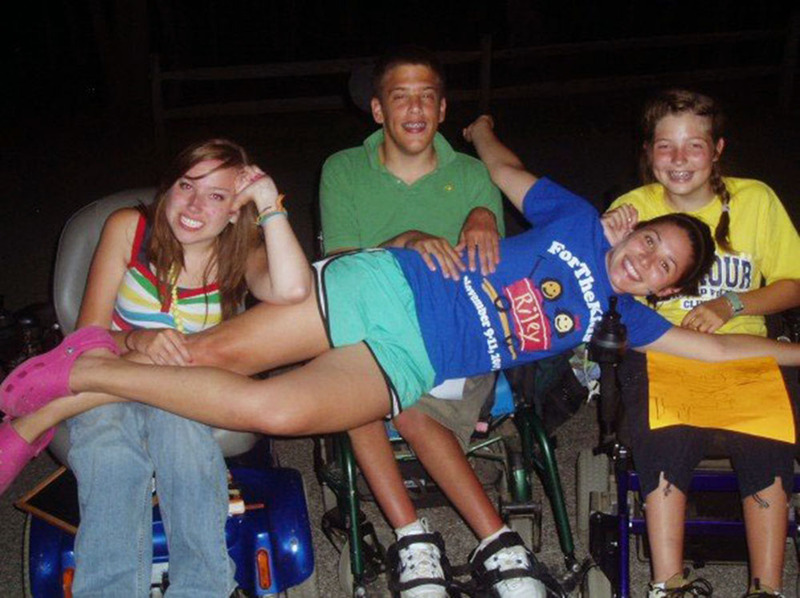 Laura, Ben, Monica, and Laura Walter on the last night at Camp Riley in 2007 (Her best friend's name is also Laura). Laura Walter came to Camp Riley at Bradford Woods at the age of 15 after losing her ability to walk. She was born with Friedreich's Ataxia, a rare inherited disease that causes nervous system damage and muscle problems. Now 23, Laura serves as a mentor for individuals with disabilities at the camp that gave her hope. Never give up, even when it seems impossible. When I was little and could walk, my family would go to Galyan’s where they have a huge indoor climbing wall. The climbing wall at Camp Riley is similar. Imagine trying to climb a wall and not being able to use your legs. Every summer at Camp Riley on the last day of camp, they have a challenge day where campers complete a challenge they choose. I chose to go up the hill in my wheelchair. It was more of seeing the other kids go up the hill that motivated me. Some kids tried to walk up the hill and that was really aspiring because I know how hard that must have been. So I went up too, and although it was really hard, I made it. At Camp Riley, they’re really into person-first language. It’s a person in a wheelchair or a person with a disability instead of a disabled person. Recognizing that I am a person first is important to me. I didn’t hear that until I was 15. I want the kids at Camp Riley to grow up hearing that, too, because it can change the way we see a person. And it can change the way that person sees himself or herself. What is normal? What does a normal person look like? No one really knows. I don’t like the word normal. Being in a wheelchair, I can still do a lot of things. Right now I’m going to graduate school, and I’m working part time. And sometimes it gets really hard, and I get tired, but I keep going because I know that’s what a true leader would do. That’s the type of leader I want to be for the kids at Camp Riley. My ability is stronger than my disability. Going through grad school and everything I have to do can become a lot. I have a part-time job where I work 15 hours a week, and then I have grad school twice a week. I have to make sure to stay focused and on top of things. And I have to remind myself to stay positive or nothing will get done. I refuse to allow my disability to define who I am. Remember who was with you from the start. I love Camp Riley. It’s probably my favorite place ever. I’ve made so many friends there, and the kids that I mentor look up to me. It’s a good feeling. I made my best friends at Camp Riley when I was 15. They’re always supportive, and we have a good time when we’re together. We recently had our seven-year reunion to celebrate my birthday. I’ve known them for so long, and they just make me so happy whenever we’re together.